Of course, as English, we have stereotypes. Every nation has them, and they can be quite fun at times, especially when you learn to laugh about them, stiff upper lip and that, what what. We seem to be seen as a nation who partakes in strange humour, constantly insults one another, whilst being ridiculously polite and able to queue until we’re blue in the face. One stereotype I just simply can’t fathom, and almost abhor, however, is the fact that we’re seen as a nation who just doesn’t have good food. It’s a well known fact that Brits apparently can’t cook and don’t eat well. I can understand that given the size that Brits are coming to be, and the state of health of our children/adults alike, the world might have this impression of us. But it’s just not fair! It’s simply not true. Having sat for dinner with Spanish families for over seven months now, and discussed food matters, the remark I now hear most frequently is; ‘I never knew you had so much to offer’. Talks of fruits, vegetables, cakes, main dishes, everything you could think of, that the Spaniards had no idea we had on offer. I can understand that if one looked at the basic meat and two veg style of Brit supper, then the wrong impression could be given. I’m not a big meat eater myself, let alone fish, so I do struggle here a bit in Spain, where the daily diet has to include at least one of each. The food’s great here, and they’re healthy, lithe, and sporty, with a good attitude to eating, relaxing, and dining. I think Brits got lazy somewhere along the way, and decided fast food was easier, like our American cousins, but even so, we still have some great things that I’ve been discussing recently with nostalgia. Of course, we can all agree to disagree when it comes to things like Marmite, but just simple things like bacon and sausages I have to hand to the English when it comes to it, as I don’t like streaky bacon, which is the standard here, and I definitely don’t like finding bits of gristle in my sausages, which I find more often than not here. 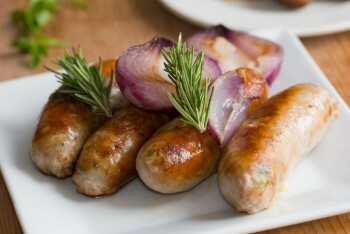 They’re not as salted and seasoned here, too, so I do believe you can’t beat a good Cumberland or Lincolnshire sausage. Apples here are entirely awful; and I don’t exaggerate this fact – even some of the Spaniards themselves have agreed with me on this. Bland, the wrong kind of chewy, a little seedy and almost fluffy so they fall apart in your mouth, they have almost no flavour and you feel like you’re only eating them in order to get one of your five a day. Granny Smiths can be bought here but they’re awfully expensive, as are Pink Ladies, but I do miss a good Cox’s Pippin, or just the simple Garden Gang ASDA apples which are a snip at £1 a bag (although inflation has probably got the better of me here and by the time I go back to England they’ll be at least £2.50). The variety of apples we have is much richer, much more vibrant, and entirely more satisfying. Other seasonal fruits include gooseberries (grosellas), blackberries (moras), redcurrants (grosellas rojas – apparently there is no difference between gooseberries and redcurrants here, according to the names they give, which I can assure you is not true…they’re entirely different fruits! ), and blackcurrants (grosellas negras, if you hadn’t guessed that), to name but a few. As far as I was aware, they look nothing like redcurrants! I tried to describe them to my Spanish family as ‘Small kiwis with hair and stripes’. Er. Kind of. We have a rich variety of fruits and vegetables, which I do believe we don’t always take advantage of, but our basics are brilliant for cooking, eating fresh, and baking. 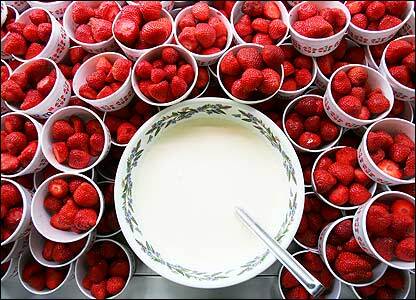 Strawberries with cream, a Wimbledon favourite, which brings me onto another lament – no cream. That was a bit of a lie, they do of course have cream, even squirty type, which I would have thought was a cardinal sin over here; but they don’t have cream that goes over a fat content percentage of 35%. Quite right, you’re probably thinking. Sounds jolly healthy. But imagine ice cream made with milk and less fatty cream, strawberries without the rich double cream coating, your favourite dessert with a covering of what almost seems like milk. A whole Summer without this – what on Earth will I do? I was looking to bake myself a nice cake with homemade ice cream for my birthday, or a semifreddo, but what would you know, all the things I wanted to bake required double cream, which just doesn’t exist here. I’d have to try and make it myself right from the cow. I can lament all I want, I suppose, but it’s not truly serious – I of course miss some British cooking, but it’s mostly the baking rather than the main courses, which I’ve never been keen on much due to the meaty content. Ginger doesn’t exist here either, really, except in Chinese food, or upon occasion in smoothies. I love a ginger nut or a good HobNob, brandy and ginger snaps, syrup pudding, ginger cake, and marmalade cake, which I hadn’t thought about much until recently, and now I’m at the verge of salivating over the keyboard. Here’s an example of some fabulous British recipes, that I would urge anybody to try, and think twice about what they say when they remark on our cuisine, or lack of it indeed! 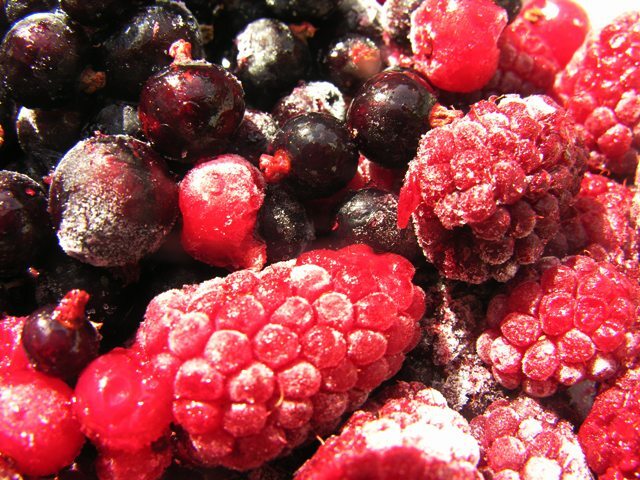 A tasty dish celebrating English summer fruits, including the aforementioned types of grosellas – redcurrants, blackcurrants, and blackberries, strawberries, with raspberries. Delicious with that naughty double cream, but just with the sweet juice that runs off the fruit mix, it’s enough to make you dream of Summertime in the Winter. What you expect to find cutting into a Summer pud. Named from the famous school, of course, after being traditionally served at cricket tournaments there, and celebrating the strawberry in a different fashion to Wimbledon. Meringue, the hard type, which is difficult to find in Spain, is broken up with a strawberry/raspberry/red fruit coulis, with sugar and that famous double cream again, but it can easily be made with normal ‘nata’ and Greek yoghurt. 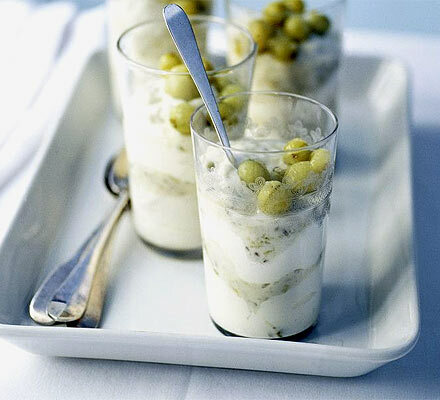 Serve it chilled in a clear glass for a nice visual treat at well as a tasty one. Easy enough to buy in British supermarkets, but well worth making. Delia’s somewhat of a Saint for us in regards to cooking, and this recipe is fabulous. Gingery, warming biscuits aren’t probably what one needs in a sunny climate, but when the weather’s cooler and you need the cockles of your heart warming, I’d recommend whipping up a batch of these. 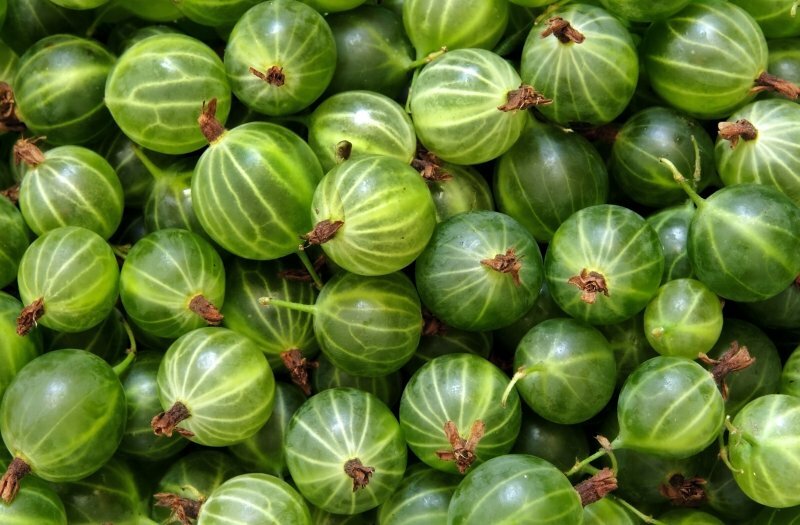 Gooseberries are obviously difficult to find abroad, but it’s well worth it for the tart taste of this tangy ‘fool’, which can also be made with other fruits such as rhubarb or raspberries. I remember not liking it so much when I was younger, but now I think it’s wonderful. Even better if you put Gin in it! Get your pitchers ready for Pimms. 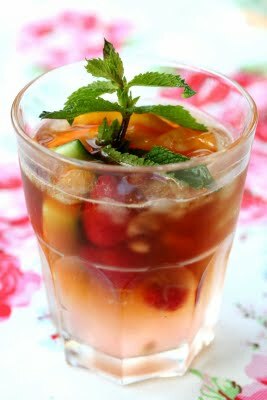 Pimms always reminds me of Summer. When made correctly, with the right fruit, and the mint, it’s just divine. I haven’t seen it here in Spain but I’m getting a bottle brought over for me thanks to the wonder that is Duty Free: can’t wait to savour that Brit taste for my Birthday. It’ll be Eton Mess, Pimms, Gin sorbet, and strawberries all round, I hope. Author savageartsPosted on May 30, 2012 May 30, 2012 Categories Baking, Home comforts, Recipes4 Comments on Wot? No Sossages? Teaching English abroad had never occurred to me, really, truly, until I was in a desperate situation. I was stuck in a job I hated – it wasn’t a bad job by any means, not at all, but it just wasn’t for me, and I felt like I didn’t have the right skills for it. I just wasn’t cut out for the world of retail banking. I couldn’t get a job in England as a teaching assistant or even working in a school, so competitive was the field and so was the level of experience needed for them to consider you worthy of hiring. Quite the Catch 22: how to get experience when no school would give you the opportunity to do so? So, to the internet I went, and my searches began to drift further afield. China, Mexico, Thailand. Those dream spots that seem so far away. They all had one thing in common, too: a qualification in TEFL (Teaching English as a Foreign Language in case any reader is not au fait with the many acronyms and abbreviations associated with language teaching – honestly, the list is as long as your arm). It was back to the drawing board again, as I lacked this qualification, too. Many companies offer it online for rather cheap prices, but for anyone considering doing this, whilst you will actually get the qualification, I would dissuade you from doing so as most companies look to hire people with at least one hundred and twenty classroom hours; that is, doing it in person with human guinea pigs to practise your newfound teaching skills on. I began to find companies advertising teaching abroad with no experience required. It all seemed too good to be true. Some offered ridiculous amounts of money, but I told myself these would be more likely to be traps, or have some hidden catch. I stumbled upon the CAPS company whilst looking on Gumtree, of all places. Through further research I found it to be a legitimate company, and the rest is history, as we say. Here I am in Spain, having been working in a primary school as a conversation assistant for seven months now; which I can easily say have been the best months of my life, despite the difficulties that can be faced abroad. The CAPS company I now work for. I am privileged to have a job such as this. Granted, the pay is essentially pocket money, and it can be difficult living with a family at times after being used to independence, but I can earn my own extra money, and I get an insight into how other families live in another country. The same cannot be said for many other people the world over. Let me get to the point of this; the world is your oyster, certainly, but more so if you happen to be lucky enough to speak English. It is incredibly difficult for those who speak other languages to have similar experiences; they do exist, of course, but with English being the international language, if you speak it, and fluently, you are much more likely to secure yourself a job or find that lucky break when everything has hit rock bottom for you in your own country. In our own countries, us English speakers are of course not novelties. We don’t need to impart it onto others, we just go about talking as normal. We don’t realise the value of our own language; whether people want to learn it or not, English is a large global presence and increases your potential job-base. 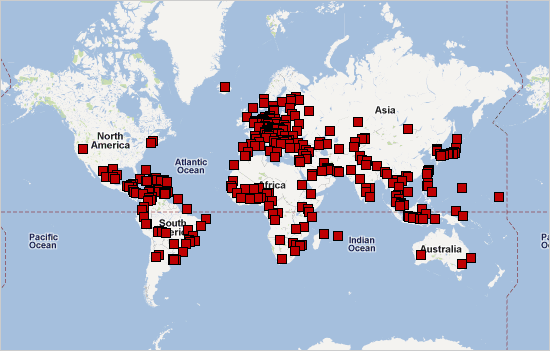 This map merely shows American International Schools, so you can imagine how many more there are and how big a business it is becoming nowadays. Even in jobs advertising teaching other languages, such as Spanish, French, or German – you name it, in international schools and in English speaking countries, as a foreigner you have less chance. These international schools look for MFL (Modern Foreign Languages, there’s another one…) teachers whose first language is most likely English, or are at least bilingual with English as their mother tongue. This makes sense for English teachers abroad, but asking for English speakers to teach, perhaps, Chinese children Spanish? I feel we’ve lucked out here. From my experience here, natives teach their own language much better than a person who has English as a second language. I refer, of course, to natives who have a basic grasp of the language of the country they’re residing in. It’s very difficult to teach English without any reference point to the pupil’s first language. This is the new technique in language teaching: don’t ever, ever use the native language. I don’t see how this can possibly work. Certainly for basic vocabulary like dog, cat, and objects that explain themselves, but for grammatical structure and longer sentences, the student could understand wrongly and make that grammatical error for the rest of their life without correction. I really like the English teacher at my school, and believe she’s doing a brilliant job, but as she admits herself, she makes mistakes because she doesn’t have English as her first language. It doesn’t come so naturally to her. So, surely it should be the same for the English teachers who teach French, German, and whatever other language is required? It doesn’t seem so. International schools usually use English in the classroom as the main language, which is why I suppose they look for natives with teaching skills in foreign languages. I think, however, to use a native speaker with English as a second language would be far more beneficial, and would be fairer in the international community. As English speakers, we have so much opportunity already, both in a linguistic teaching context and in other alleyways such as business, as it’s the lingua franca (allowing communication between people who do not share the same mother tongue) of the world, it seems. Whilst it’s actually only the third most spoken language in the world, people use it as a vehicle to communicate between countries. I’ve met many couples here in Spain who do not share the same mother tongue, for example an Italian man meets a Spanish woman, and at first, they speak English to communicate with one another. It’s fascinating. Especially for a language where the pronunciation is often very difficult as there are very little rules regarding how words are read. 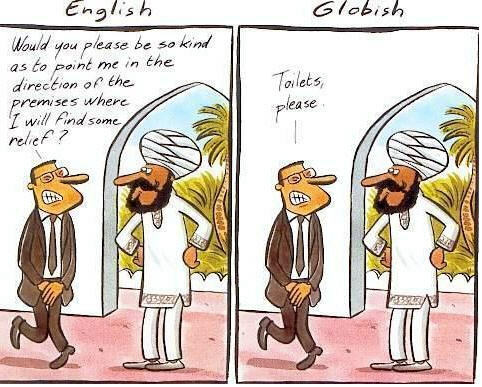 Complex English versus International English. I truly have the world at my feet with the language given to me as my mother tongue; and I’m genuinely not exaggerating. I’m lucky enough to speak English, which already lets me apply for basic teaching and coaching jobs regarding English abroad. I’ve managed to take classes in a school alone with no teaching practice or training before, and gain no less than six private tuition students, which astonishes me sometimes. It might not be the most sensible idea, but if you select your employees carefully, just their natural ability with language is all you need in order to learn from them. This July I will be doing a TEFL, which will broaden my horizons and allow me to go further afield should I wish, to countries such as Thailand. However, in some countries such as China or South Korea, all you need is a degree in a somewhat relevant subject, such as English, Literature, Linguistics, or Education. This is complete madness – I’ve yet to hear of similar opportunities besides childcare and au pair work that exist for non-English speakers. Whilst I am happy to take advantage of this, I do feel the advantage I have in the world. I know for others it isn’t so easy, and I am glad of the gift of language I possess that I may pass on to my children and others. So, next time you are just chatting over coffee or singing along to your favourite song, calling your boyfriend or just simply talking to yourself, if you’re that way inclined, remember how lucky you are to be speaking the language of English. It might be big-headed, and it might seem rather provocative a statement to make, but it truly is your ticket to greater things, and, sadly, positive discrimination in the international workplace.